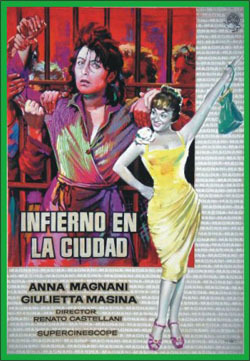 (1960) Anna Magnani, Giulietta Masina. A harsh study about the grim realities of life in a non-coed, totally female prison environment. Story concerns a young girl who comes to prison and experiences the entire prison subculture. The inmates she befriends vary from big tough dangerous dames to smaller submissive ladies who are totally lost in prison life. Very exploitive, yet still a fascinating look at women's prison life. This is a damn good movie. Three stars by Leonard Maltin. 16mm.